Understanding the transmission of most human DNA is fairly straightforward. Y-DNA is transmitted from father to son and follows a patrilineal descent equated with a man’s surname lineage. Only males have Y-DNA and they can only pass it on to their sons. Mitochondrial (mtDNA) is the exact opposite and is passed from mother to child. It follows a matrilineal descent – great-grandmother to grandmother to mother to child. While men receive mtDNA, they cannot pass it to their children. Only women can pass mtDNA. A third type of DNA is autosomal DNA. It is passed from the 22 pairs of autosomes that we as humans have. For each pair, one chromosome comes from our mother and one from our father. The chromosomes we receive from our parents are also combinations of the chromosomes passed from our grandparents. All of our ancestors, to a point, contribute to our autosomal DNA. Finally, there is X-chromosomal DNA. Contrary to popular belief that it was named after its X shape when two X-chromosomes appear together, the 22 autosomes also appear roughly “X” shaped during mitosis and therefore there was nothing unique about its appearance. Hermann Henking named the chromosome the X element because of its unique properties. The “X” designation has been applied to other items with unique or unknown properties such as X in algebra, X-rays, and Planet X (Pluto). The X-chromosome; however, has a bit of mystery to its transmission. While it is not difficult to understand, it takes time to explain the unique ancestry that contributes to an X-chromosome. Additionally, the X ancestry for women is different than for men adding to its mystique. Men only receive one X-chromosome as they receive a Y-chromosome from their father which in turn determines their gender as a male. Men inherit their X-chromosome from their mother. 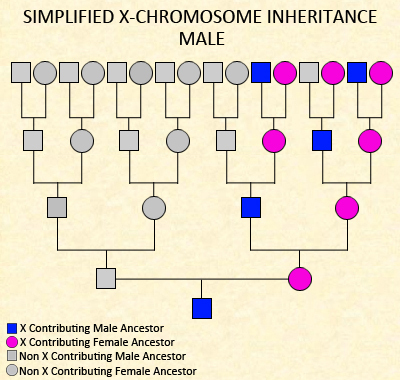 It is possible that a man may inherit his X as one of his mother’s two X-chromosomes completely intact; however, it is more likely he will receive a recombined X that includes segments from each of his mother’s two Xs. Since women receive two X-chromosomes, they inherit these from each parent. The one received from a woman’s mother is transmitted the same way as a man receives his X-chromosome. The other X-chromosome transmitted intact from a woman’s father. This comes from his mother and may be an intact chromosome or a recombined X transmitted to him from his mother. 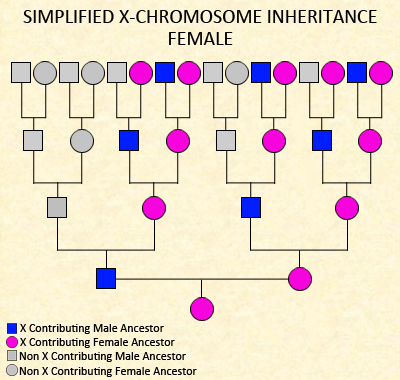 To get a clearer picture on the overall inheritance patterns of the X-chromosome for men and women, I recommend two blog posts by Dr. Blaine T. Bettinger: Unlocking the Genealogical Secrets of the X Chromosome and More X-Chromosome Charts. My interest in the X-chromosome transmission is based on the lack of matching X segments I have with my two brothers. In fact, the amount of 14.7cM on one segment on the X that I share with my oldest brother is rather insignificant by comparison to others in my family. My other brother and I share 45.9cM over two segments. My two brothers share quite a bit with each other on the X with 142.2cM across three segments. To add to this disparity, I share more with my two first cousins than I do with my oldest brother on the X: 44.7cM over two segments with one and 102.9cM across two segments with the other. Even larger than these shares, my family has two second cousins who share 122cM on one segment. The grandmothers of these two second cousins were sisters. I was curious about this inequality and I asked individuals to post on 23andMe’s Community Forum their total matches on the X-chromosome with known relatives; however, some exceptions needed to occur as parent/children relationships will share 100% on an X-chromosome, a paternal grandmother and granddaughters will share 100% on an X-chromosome, and sisters and paternal half-sisters will share an exact copy of their father’s X-chromosome. Obviously, these numbers would skew the results somewhat and do not represent an unknown quantity. While I won’t list all of the results here, I will list relationships where at least five matches were documented. The lower and higher ranges, as well as the central tendencies of mean and median, are represented in centimorgans (cM). *full brothers, full brother/sister, maternal half-brothers, and maternal half sisters. The numbers are probably skewing higher, as I discounted all non-matches. This was done because I could not verify if the given relationship fell within X-chromosome inheritance patterns. For example, a male subject may have listed a second cousin relationship as 0cM without realizing that a male’s paternal second cousins do not share genetic material on the X. This exercise revealed that it is difficult to ascertain a relationship on the amount shared via the X-chromosome, as the numbers were across the board. Part of the inequality may be attributed to daughters receiving an intact X from their fathers. Without recombination during these transmissions, larger segments of X-DNA will be inherited across generations. In my family, a sibling match of 14.7cM was the lowest of the observed sibling pairs; as mentioned earlier, this was between me and my oldest brother. The aforementioned second cousin match in our family at 122.0cM is the highest reported for that relationship. Since spring 2010 when my results and those of my siblings were returned, I have been immensely curious on why I share so little on the X-chromosome with either of my brothers. In addition, Ancestry Finder lists my oldest brother (Chuck) as having three matches on the X. Two of those matches exceed the amount we share (20.6cM and 26.6cM). My brother John also has three matches – two of those match Chuck’s shares and one is unique. Unfortunately, I have no X matches in Ancestry Finder. As I ruminated on the results, I began to realize that recombination of my mother’s two X-chromosomes dealt Chuck and me X-DNA from divergent maternal grandparents. The question was who inherited from whom? My mother's parents and siblings, which would help in determining this issue, had died decades ago. While I have five living first cousins on my mother’s side, three were adopted. Of the two remaining blood first cousins, I tested Joan first in 2011 – she is the daughter of my mother’s sister Louise. Unfortunately, she could have received her X-DNA from either or both of our grandparents and there was no way to determine the origin of her matching segments. Jane, my other blood first cousin, tested in 2012 and she and I had two matching segments totaling 102.9cM. This large match was significant in that she is the daughter of my mother’s oldest brother. Because of this relationship, I could use her results and partially phase our X-chromosome segments to specific grandparents. Since she received one X from her father and one X from her mother, the matching segments she had with me, my brothers, and Joan would come only from our maternal grandmother. The X-chromosome that passed from Jane’s dad came solely through our grandmother. Unlike my mother and my aunt who received an X-chromosome from their mother and an X-chromosome from their mother, my uncle’s X-chromosome came solely from my grandmother. In addition, those areas where Jane matched me but not my brothers indicated that my siblings received their corresponding segments from our maternal grandfather. While I could not satisfactorily phase all of my X-chromosome, over half of it was attributed to my mother’s mother. Those areas where we did not match Jane do not indicate that those segments came from my grandfather. If fact when comparing Jane with my mother, they only match on the same segments that Jane matches with me. This indicates that my mother and her brother received different X-DNA from their mother due to X recombination. As far as further testing is concerned, there are some second cousins and second cousins, once removed that are descended from my grandmother’s sisters that may shed additional light on the propagation of the X in our family. Finding these individuals and convincing them to test may prove difficult. While my grandfather was the only child of his mother, she had siblings whose descendents should have some matching DNA segments to our family. Shared genetic material with these individuals may further confirm from whence my brothers’ and cousins’ X-DNA originated. In certain cases, tying our X-chromosome segments to a specific great-grandparent may also be possible. Since I can only confirm the originating grandparent of 51% my X-DNA, I tend to believe (but cannot confirm at the present) that my X-chromosome may be an exact copy of my mother’s inherited X. If this is the case, I would not have inherited any X-DNA from my grandfather. 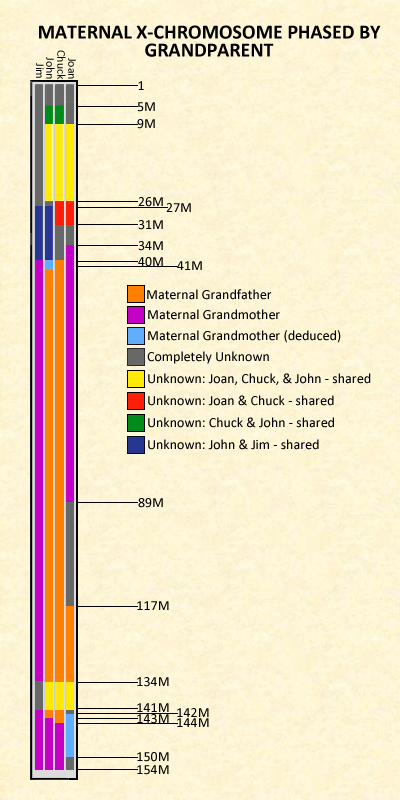 This would also indicate that my brother Chuck’s X-DNA is 97% from our grandfather and only 3% from our grandmother. My brother John would then have 77% of his X-DNA from our grandfather and 23% from our grandmother. If my hypothesis is correct, it may suggest why I have no matches on the X-chromosome. With exception of one line which originated in Southern France, my grandmother’s ancestry was German. If one follows her X-chromosome inheritance to its natural genetic conclusion, her X-chromosomes were 100% Germanic in origin. The earliest date for her ancestors immigrating to the US was 1848. While my grandfather had a significant German element to his ancestry, his X-inheritance contains Swiss, Scots-Irish, German, and probably English antecedents. To the best of my knowledge, my grandfather’s family appears to have been in America from at least the time of the Revolutionary War. Since becoming a 23andMe customer since 2010, I have noticed a dearth of matches to my German lines. Since my mother is roughly 70% German and 12% Swiss, I find that most of her 23andMe matches appear to be related to her English and Scots-Irish ancestries rather than to her German and Swiss roots. While I do not have facts and figures for 23andMe’s customer base, it appears that Germans are not among the best represented groups. While Ancestry Finder is not a perfect indicator of ancestral matches, it does allow for some additional conclusions to be drawn. For my mother, Germany ranks third behind the United Kingdom and Netherlands for her matches whose grandparents were born in these countries. I would have assumed that her German matches would have ranked first; however, this was not the case. Despite my theories which remain unconfirmed, I was able to phase a large portion of our family's X-chromosomes to a particular grandparent by comparing our results with a first cousin who was the daughter of a maternal uncle. In the absence of a tested grandparent, a greater number of tested relationships of maternal uncles and female first cousins descended from maternal uncles would aid anyone in phasing his or her maternal X-DNA. Проблема в том, что мать передает дочери одну из своих X-хромосом, а другую передает отец. А потом своей дочери или своему сыну она может передать любую из этих X-хромосом. Но для исследование близких популяций это более точный метод, чем аутосомы. Веренич ранее уже писал про использование Х-хромосом для филогении. Сложность заключается в том, что вторая Х-хромосома не полностью инактивируется. Подтвержден факт рекомбинации (правда ограниченной) между двумя Х-хромосомами. Поэтому к дочери может перейти одна из Х-хромосом, частично рекомбинированная с другой. Основной вывод: в данных примерах родство по Х-хромосоме прострелило до семиюродного. Скажите пожалуйста: какая величина УПСа на Х хромосоме может заявлять о действительном родстве? И какую мелочь не стоит вообще принимать в расчет. Наверно не должно быть больше 7 поколений до общего предка. Чуть позже (это значит после 4 августа) я дам вам подробную статистику по моим документальным родичам (от шестиюродного до девятиюродного родства) на Х хромосоме. Сейчас со временем полный кирдык. Через неделю отпуск (Амстердам-Киев-Москва-Нальчик и окрестности, порой не близкие, вышепомянутых населённых пунктов). *** Тема самому очень интересна. Вместе посмотрим и помозгуем, что к чему. Уважаемый Михаил! Не планируете ли Вы опубликовать эту долгожданную статистику? Ближе к выходным, начну выкладывать, что есть. Начал просматривать в ФТДНА данные по Х хромосоме свои и двоюродного брата, а штатный хромосом-браузер Х хромосому не отражает. Ни в виде рисунка, ни в табличном представлении. Нет ни матери, ни сестры, ни дочки - вообще ничего. С мамой и дочкой понятно, но почему кузенов нет? ВБОП 1 поколение (брат и сестра).